NEWS JUNE 2018: because of the current political & social crisis in Nicaragua and its problems & dangers (violent encounters, supply shortfalls, increased criminality) it is currently advised not to travel to Nicargua – unfortunately Rancho Esperanza and its project Puentes de Esperanza have to stay closed until the situation calms down. We really hope that things will get better soon and will keep you up to date! 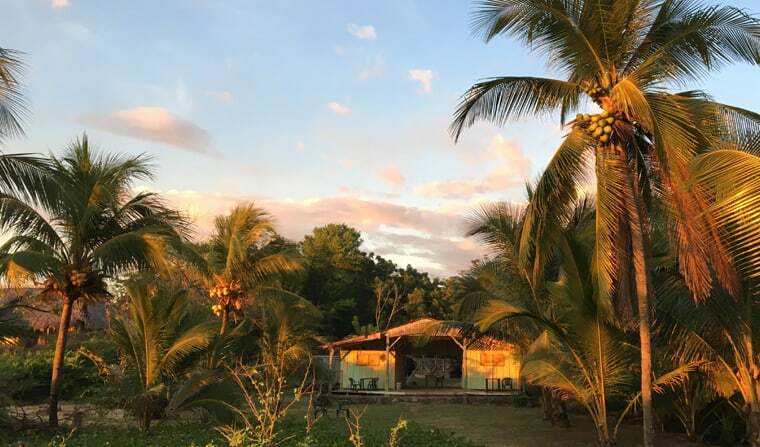 The surf hostel Rancho Esperanza is located on the pacific coast in the north of the Central American state of Nicaragua, close to Honduras and El Salvador. You can reach the small fishing town of Jiquilillo either from Managua (the capital of Nicaragua) or El Salvador. By bus you can get from Managua or Leon via the city of Chinandega to Jiquillio, or you take a taxi. From La Union, El Salvador you can go by boat to Potosi, Nicaragua. You can choose between dorms or „cabañas“(cabins). Two Dorms provide room for six people, in the 7 bamboo cabañas can sleep 4 people each. Some of the cabañas have a private bathroom, made of recycled glass bottles (such an example!). There is also space for tents or hammocks. 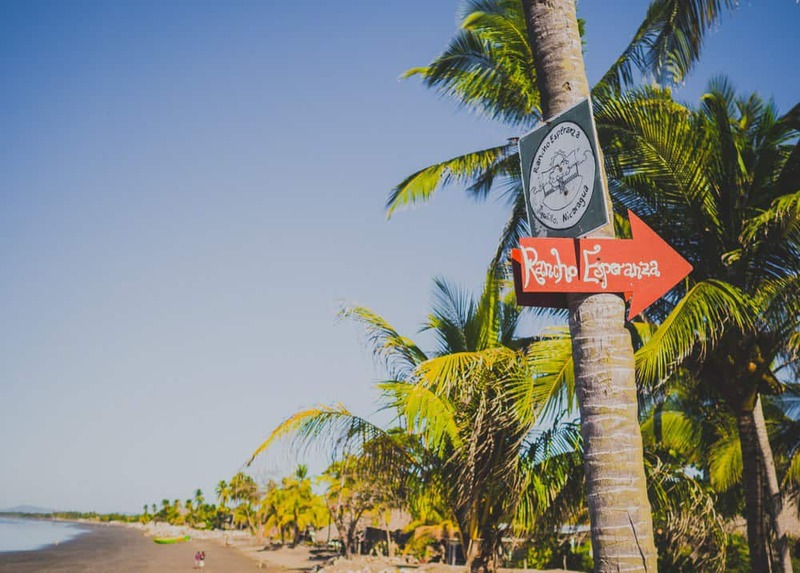 Located in tropical climate and with off-shore wind almost all year round Nicaragua is nearly 365 days a year a surfer’s paradise. The conditions in Jiquillio are ideal for beginners and intermediate surfers and as spots are uncrowded, they offer waves for everyone. At the hostel you can rent surfboards for 11,-USD per day of which 1,- USD is used for supporting the organization Puentes de Esperanza. Surflessons also cost 11,-USD per hour and again 1,- USD goes to Puentes de Esperanza. The young teachers learnt surfing in the social project Surf Club and are now sharing their knowledge with guests. For the ones who already know how to surf, there is also the option of going by boat to an off-shore-break which costs around 100,-USD. Rancho Esperanza runs and supports social and ecological local projects – education for local kids, teaching them English, computer skills or surfing are only some of the activities Rancho Esperanza provides. 2015 the independent non-profit-organization Puentes de Esperanza was founded to run all these programs. A percentage of the hostel´s income is since then going directly to Puentes de Esperanza. If you are interested, read more about their projects on our blog entry. Additionally Rancho Esperanza is trying to decrease their ecological footprint in various ways: composting toilet and kitchen waste, mindful water usage with a grey-water recycling system and maximizing the use of local and natural materials in their buildings are some examples. Plus they use local food, like fresh fish or seasonal fruits in their restaurant. Jiquillio is located in a remote area, that means that you won´t find supermarkets or fancy restaurants or bars around, however you get to know better the life of the people there. If we want to contribute to a sustainable tourism, it also means being open minded and respectful towards the locals, not showing valuables or behaving as the “rich, know-it-all” tourist but rethinking our own culturual imprint and needs. If you stay more than a month you can also volunteer in the project Puentes de Esperanza – read more about this option in our blog post: Volunteering in Puentes de Esperanza. All other details about the surf hostel Rancho Esperanza you can find on their webside: http://rancho-esperanza.com.